The Arfordir Coastal Heritage project was set up in 2009 to examine the potential impact of climate change and rising sea levels on coastal archaeology, and to involve local interest groups in the assessment process. The project was initially intended to run for a period of three years and was scheduled to end in March 2012, however due to continued interest and a potential HLF grant building on the work of the project it was decided that work should continue, though at a slightly less intensive level. The main aim of the project for 2012-13 was to continue to support established volunteers and groups and to respond to alerts from the public. By doing this a number of new sites have been identified and a number of previously identified eroding areas have continued to be monitored. A small number of dedicated volunteers have continued to work on sections of coastline at a slow but steady pace. 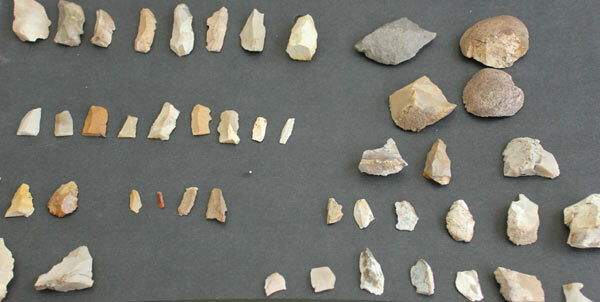 During this year of the lithics (PRN 31726) were discovered in a new area where no such finds had been made before. Attention was drawn to a section of the coast where the sand dunes had eroded, exposing a former ground surface. 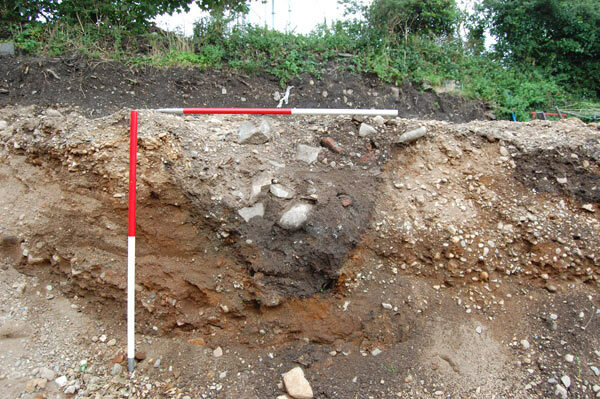 Investigation of the area revealed that lithics were present on top of the surface as well as in the section of the eroding cliff. During the brief visit five pieces of struck flint were discovered, including a small bladelet struck from a core, however the most interesting artefact was a flake of as yet unidentified stone which had been retouched and shows evidence of use-wear. Two flint fragments (PRN 31727) were also discovered in close proximity to a deposit of burnt stones (PRN 31601) thought to be prehistoric in date, identified as part of the project in 2011. 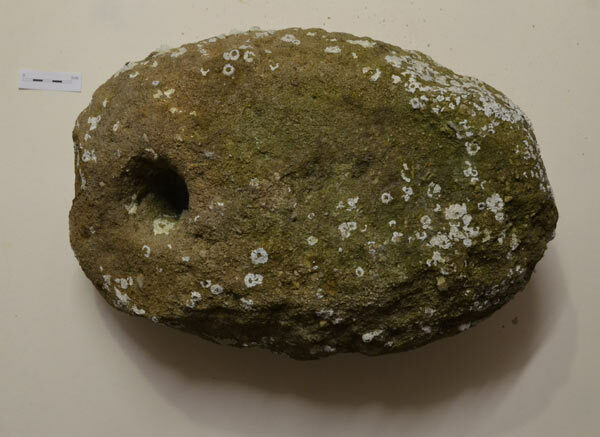 The Trust was contacted by Mr David McCreadie in September 2013 about four stones he had found when diving in the Menai Strait. 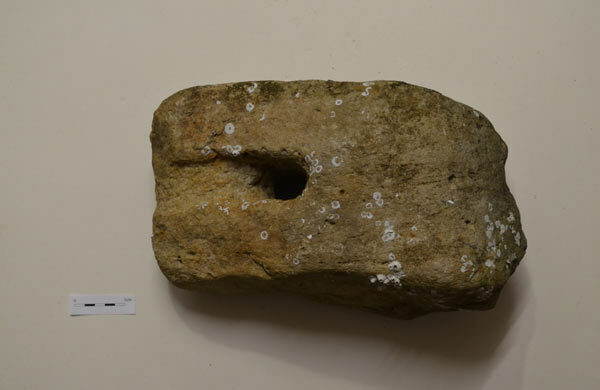 He had interpreted these as Roman anchors, but was keen for the Trust to look at them. 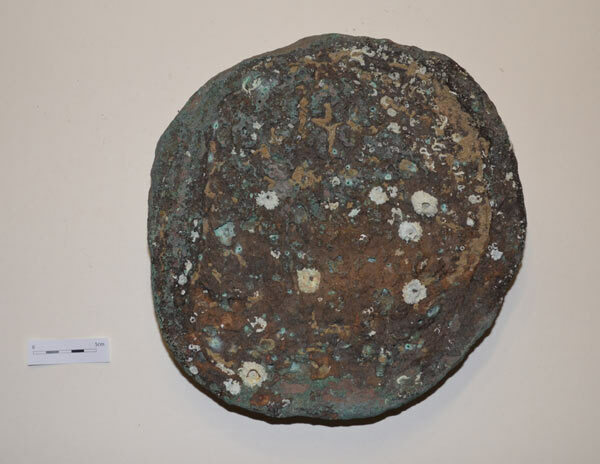 Mr Ian Jones at Oriel Ynys Môn had also made the Trust aware of a copper ingot found alongside a number of stone anchors on the floor of the Menai Strait. Further enquiries revealed that both sets of finds came from the same, or very similar, location, though found by different divers. At present we do not have an exact location, but an approximate NGR is SH52216944, which locates them a short distance from the shore close to Plas Newydd, and between Plas Newydd and the Vaynol boathouse. The one set of finds consisted of four millstones of different sizes which, from their appearance, may have been reused as stone anchors. 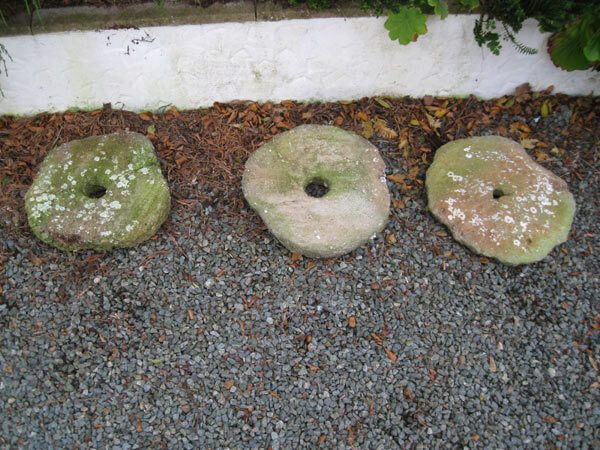 The other set of finds, held by Oriel Ynys Mon, consists of three stone anchors, one millstone, and one grinding stone, the latter two also possibly reused as anchors. Found alongside was a circular copper ingot of Roman type, with a segment of a similar ingot. The complete copper ingot and the segment are of Roman type, and complement a number of similar finds from Anglesey. Though all the finds are from the same location, they are unlikely to be of similar date, nor from the same ship. Mark Beattie-Edwards, Programme Director for the Nautical Archaeology Society, and compiler of the ‘Big Anchor' project, says it is very common to find anchors together – it can indicate a regular mooring location, and loss of anchors was relatively common. During the 2012 Anglesey Agricultural Show a member of the public came to speak to the Trust to inform us of a collection of over 100 lithics picked up in the area of Porth Ruffudd, Holyhead. Though the majority were undiagnostic, there were narrow and broader blade microliths indicative of a Mesolithic date, and other flakes more typical of the Neolithic period. Finds of Mesolithic date had been reported from the site by the Trust in 1982, and the Trust had also been made aware of another collection of flints from the site which has not been published. Further survey and examination of the site, hopefully with analysis of the unpublished collection of flints, will be undertaken in 2013. 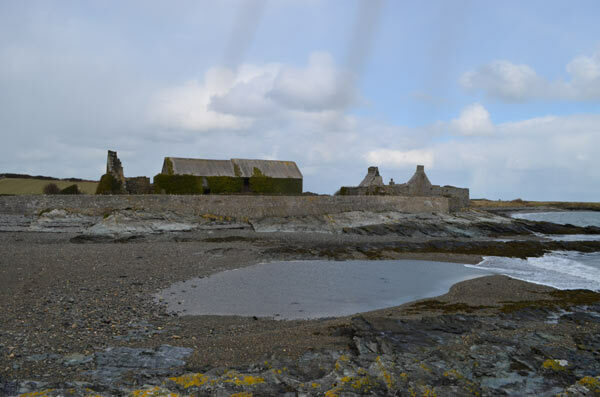 A photographic record was made of an 18th century coastal storehouse at Cemlyn, Anglesey. The site consists of the remains of yards, storehouses, offices and domestic buildings where coastal trading, both import and export, was carried out. The buildings are known locally as Y Storws, though the OS map of 1900 shows three properties – to the north is Glan y Mor, south is Storws (not named) and west is Min y Don. The Bodorgan Mss at Bangor University record rent in 1779 for Shadrack Williams paying 5/- in rent for the storehouse in addition to £12 for the farm of Fronddu. Shadrack was a local farmer and trader and dealer, and appears to have built the storehouse at Cemlyn in or shortly before 1779. He dealt primarily in grain and coal. His descendants continued to trade from the site until 1907. 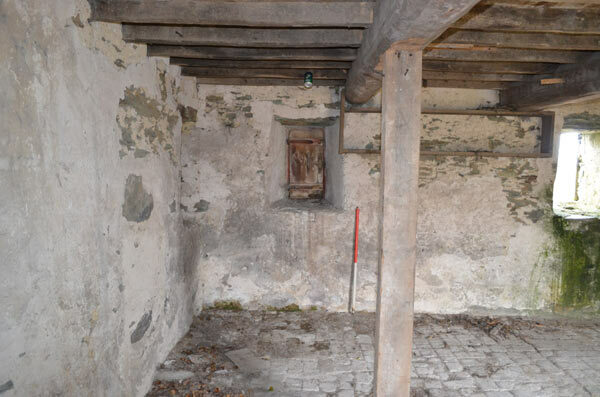 Members of the family lived in the house on the site so that they could sell the coal and supervise storage of the grain. Shadrack's nephew was the preacher Rev. John Elias, who in his memoirs describes his uncle as ‘a great improver and owner of vessels', a shopkeeper, corn merchant and coal dealer. He purchased oats and grain from local farmers for export along the north Wales coast, and then the vessels returned with cargoes of coal and salt. The site lies on the south-east side of a small narrow promontory which forms the west side of Cemlyn Bay. North of the site is the location of the first Anglesey lifeboat, founded in 1828 by the ‘Anglesey Association for preservation of life from shipwreck', it was closed in 1872 when it was transferred to Cemaes Bay. Mooring posts are marked on the OS 1900 map between the storehouse and the lifeboat house. To the south lies the house of Bryn Aber, the former home of Captain Vivian Hewitt (1888-1965), aviator, ornithologist and wealthy recluse, who created the sea water lagoon inland of the shingle spit by building a dam across the outlet. The land is owned by the National Trust, and leased by North Wales Wildlife Trust, who manage the nature reserve at Cemlyn.